His response to working on an inspired recipe with The Gravy: "That would be heaven on Earth!! 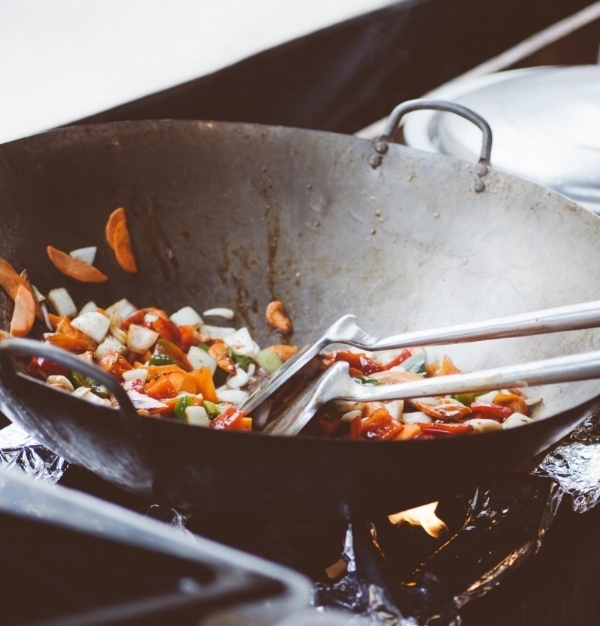 Love food lol"
Consequently, our go-to pan, the wok, does the same thing: brings everything together - all the vibrant flavors, nutrients, and spices melding perfectly and harmoniously. Gather your closest friends around the table with this easy, fun and straightforward dinner plan. No Need to Rush - Cook in batches to keep from overcrowding. A great rule is to never have more than a lb of stir-fry ingredients in your wok at a time. Hot Wok, Cold Oil - Preheat your wok by turning up the high heat. Use Oil with a High Smoke Point - some of your options include ghee (Trader Joe’s has a great, affordable one), or coconut oil. Avoid using Olive, Canola, or Vegetable Oil. Show Out with Sauce - A stirfry isn’t complete without it’s signature sauce. We love chile oils, sesame oil, fish sauce and coconut aminos (again, try Trader Joe’s!). Turn your overhead vent fan on until you’re done cooking. Saute: Start with coating your wok with a tablespoon or two of ghee or coconut oil. Next, add in all your veggies. Wait a minute, then add in your noodles. Wait a minute,again, and add in your cooked chicken. Mix for another minute. Sauce: Once your protein is cooked, and your veggies have almost reached your desired tenderness, you’re going to add in some sort of liquid or sauce.